One application area for 3D printing that is often overlooked when discussing innovation is the concept/communication model. Graphical representation of an idea often falls short of the impact of a 3 dimensional expression of the concept. Cars utilizing 3D printed components have graced auto shows for years. What is more unusual ---production of an automotive showroom model using only 3D printing machines and materials without the need for outsourcing. This feat was recently accomplished by leveraging cost effective and high quality equipment to produce highly accurate components with exceptional aesthetics coupled with state of the art finishing expertise within a single facility. Scuderia Cameron Glickenhaus, a boutique manufacturer of exotic high-performance racing and road cars, needed a show room quality model to help promote a planned new product line. 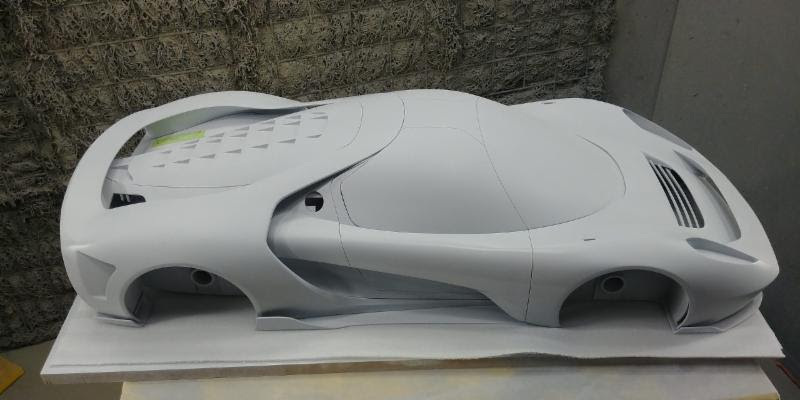 The company asked Aerosport Modeling & Design to build a one-off 1/5th scale replica display model of a new street legal production automobile--- the 2019 SCG 004S super car. “When we got the call on this project, I thought about how cool it would be to produce the entire model with only our in-house 3D printing capabilities,” said Geoff Combs, owner, Aerosport Modeling & Design. HP was chosen for this project because the process can produce multiple parts on one platform quickly and easily. SL technology would provide printed parts with a nice, highly detailed finish and the versatility to select high clarity clear or pigmented materials. Both processes produced accurately dimensioned parts for a precision assembly. The body panels, chassis and tires were printed on the HP Multi-jet Fusion with HP PA12 nylon material. The team split the panels into multiple sections to fit as many parts on the build envelop as possible. The rest of the car was in 12 pieces, bringing the total body pieces on the HP machine to 18 that were bonded together and blended to a seamless finish. Window sections were printed on the UnionTech™ RSPro 600 SL machine with Somos® EvoLVe 128, a photopolymer designed for highly durable, fine featured parts. This combination provided the team with highly detailed parts for the window cutouts and pattern. These window sections were finished and painted gloss black. Also printed on the UnionTech™ RSPro 600 were the wheels with Somos®EvoLVe 128. The stereolithography process was chosen for the wheels to take advantage of the smooth finish and detail provided by the nominal 0.007 inch beam size of the industrial strength 355 nanometer laser. These parts were then painted silver. Brake rotors were also printed this way for maximum detail. High feature finish pieces such as exhaust tips, mirrors headlight housings were printed on another SL machine with Somos® EvoLVe 128 material. Headlight and taillight lenses were printed with Somos® Water Clear 10122 on the other SL equipment. The fronts were clear coated and the rears were smoked with red clear. This is an instance where material properties and finishing expertise combine to produce the desired realistic finish. The under body, chassis, wheel pans and tires were all produced on the HP machine using PA12 (nylon). During the initial launch event for the car, it received lots of press attention and interest from potential buyers. This is exactly the desired effect of a physical model. By utilizing a variety of 3d printing equipment, materials, and software the Aerosport team facilitated the creation of a concept model that elegantly communicated the innovative design of the SCG 004S super car. Just as intriguing, there are many remaining unexplored potential applications for 3D printing as this industry continues to attract worldwide attention. For nearly 20 years, UnionTech stereolithography (SL) 3D printing equipment has been developed and manufactured in an environment of intense regional competition. Our equipment is robustly constructed for low cost of ownership, from the initial purchase onward while producing the highest quality parts. Explore the fresh dimension in SL 3D printing UnionTech makes available in a full line of commercial and production scale machines. Aerosport Modeling & Design, Inc. was established in September 1996. Since the beginning, the goal has been to produce the highest quality prototypes, appearance models, working models and machined parts possible and to meet or exceed client expectations 100% of the time. As a partner in the process, we aim to serve as an extension of our client’s own design and development team. For more than 20 years, Aerosport has served thousands of satisfied clients from many disciplines including automotive, medical, electronic, military, aviation, toy, consumer and more.